Lemon, cucumber, parma ham, onion, lime, and cantaloupe gazpacho are arranged as an amuse bouche. All photos courtesy of SIK/TENG. Modern cuisine places a strong emphasis on senses beyond just taste; well-designed tableware and aesthetic lighting aren’t just nice, but rather crucial, to the contemporary dining experience. 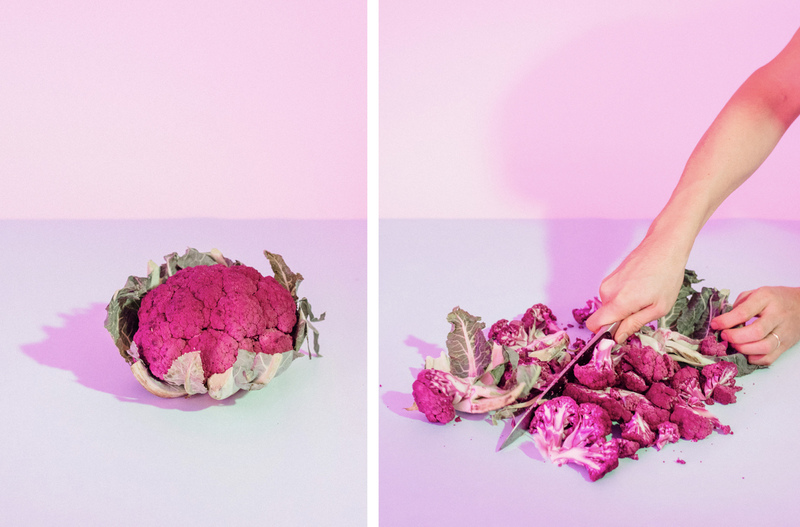 Instead of exclusively focusing on food that tastes good, culinary intrepids are looking towards elements that can further enhance or radically change the act of eating. This trend in experiential development is evidenced through concepts such as utensils made for playing with one’s food, or plates that revolutionize classic dinnerware silhouettes. 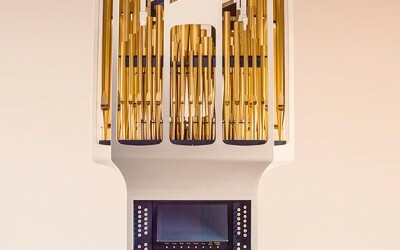 While these innovations address visual engagement and design, music introduces a new way to revolutionize sensory engagement with food. 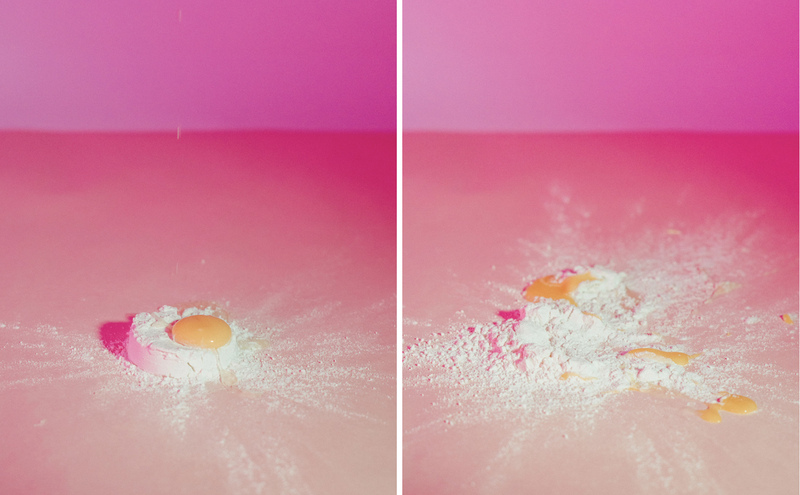 An egg is dropped on flour as part of the process of making pasta dough for SIK/TENG’s first supper club. Playlists are no longer background music thrown on during a party, but rather a carefully curated part of eating. This food-music connection is visible in the new supper club concept SIK/TENG, which creates a menu inspired by a music album. 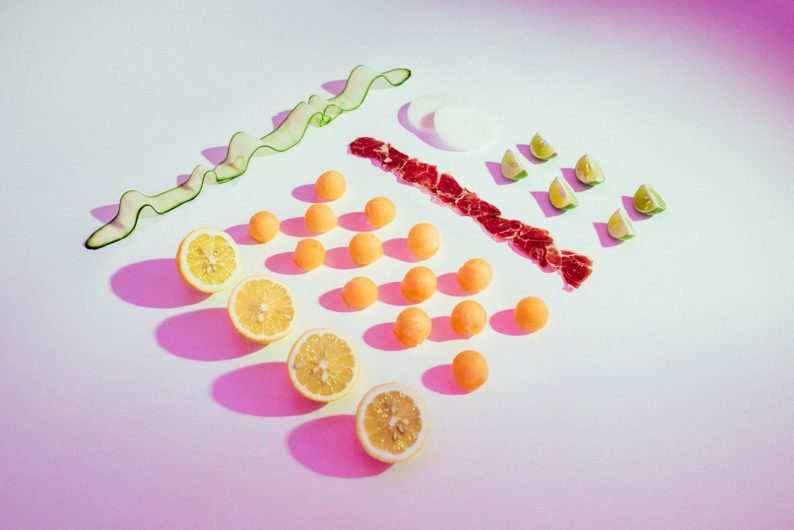 Using film and photography to not only share their food, but highlight its shapes, shadows and colors, SIK/TENG’s first series draws its bright and playful aesthetic from the French indie pop band Phoenix’s album Wolfgang Amadeus. By transforming taste with sound, SIK/TENG allows us to access through a new channel the emotive and thought provoking capacity of food. 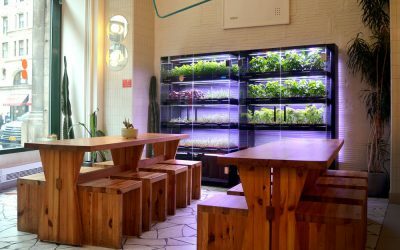 We spoke to Jocelyn Liipfert Lam, creative director, about the rest of the team behind SIK/TENG and how their music-food concept has developed. MOLD: What inspired you to create SIK/TENG? Jocelyn Liipfert Lam: The inspiration for SIK/TENG came from two of the members of the group, Mike and Paul, who played in a band together, were really good friends and loved cooking in their off time. Our whole group of friends had spent a lot of time together going to these music shows and then cooking these epic meals afterwards, and for years I’d been telling Mike and Paul they needed to create their own YouTube cooking show. So, we’d been talking about a loose concept around music and food for years. My background is creative – I work with a creative agency and a lot of our friends are in the creative field too – and we had this idea about instead of doing a cooking show, doing a supper club series, where we created food experiences that are inspired by music, and we focus on how we share those experiences through photography and film. So that’s the idea where SIK/TENG came from. And there’s also kind of a secondary objective in that the creative industry in Hong Kong is an underrepresented one. I think we’re all quite passionate about trying to create something that represents some of the creative work and talent coming out of Hong Kong. How do you choose the music that inspires a particular menu? When we select an album, we’re trying to hit on a few different things. We’re trying to find an album that we all love and have a shared interest in, but also one that translates quite well into a visual art direction and into an interesting menu. We brainstormed a few different ideas, and I think we picked Wolfgang Amadeus by Phoenix because we were going back and remembering some of our favorite albums. That album came out around the time Mike and Paul’s band was playing together and we all had really fond memories of that album and that summer. When we were looking for an album it just felt like the right fit, because it’s really colorful and pop based, which lends itself to an interesting play creatively both from a gastronomical perspective as well as from a visual art direction. As we’re looking at future projects we’re trying to have all these pieces come together: the food, the visuals and the music. We need something that can translate really well across all those mediums, which is a bit of a challenge. 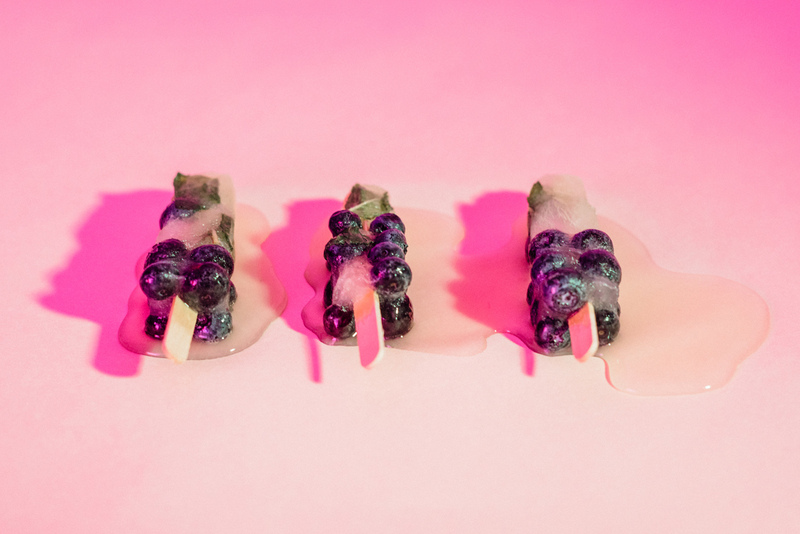 Mojito popsicles with blueberries and mint melt. Can you tell me about the team behind SIK/TENG? Who has been instrumental in shaping the project? The way we like to think about SIK/TENG, and how I think it will evolve with future projects and stories, is that it’s a bit of a platform. There are a few of us who are leading it and who are core to developing it each time, but as we continue to develop it we’d love to bring in other chefs, photographers, or videographers to help interpret stories in their own way. For the first story we did on the Wolfgang Amadeus album everything starts with Paul and Mike, who are the musicians and amateur chefs who love food. We look to them to pose different concepts about what musical album they might like to do and what kind of food pairing that might entail. From a creative perspective it’s myself and Jon Lau, who’s our photographer, and Ricky Nyhoff, who did the filmography, and then Meryl Lau, who does all the design of the event and layout and helps with a lot of the styling. We’ll consider a lot of different concepts for food and music, and think about which of these will lend themselves best to the way that we photograph and film these different stories. 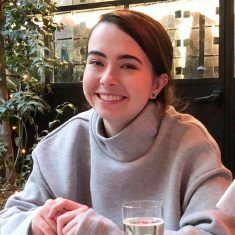 Jacqui Matthews helped us with the production of everything which was quite a big job, because we’re all doing this as our side project not our day job, so it kind of takes quite a lot of work on top of all of our work, but Jacqui helped produce and bring it all together. She helped work with Mike and Paul to pull together all the food ingredients and the plating props and styling and backdrops. From a creative perspective, we were planning out what are all the different shots going to look like, what different compositions do we want to look at and how can we really experiment and play with how we shoot everything in a way that feels true to the spirit of the album, which is quite experimental and upbeat and high energy; so how do we bring those same themes into the way that we photograph it, and also how we film it as well. So, we play quite a lot with these ideas of repetition and repetitive movements that were kind of in sync with the music itself. How do you use film and photography to showcase the food and music, and why is there so much emphasis on that part of the process? A big part of this project is how we tell the story of food and music. The way we capture the art direction, and the way we bring that to life through film and photography all has to very consistent with the spirit of the musical album that we’re looking to cover. I think film and photography are an interesting way to translate the feelings, and emotions, and ideas of the album, using food as our prop to do that. What we pulled from, Wolfgang Amadeus, is very pop inspired, experimental, creative, high energy, and the way that that album was kind of consumed was very much like a summery rock album, that for us we enjoyed as a group of friends – I remember listening to that album quite heavily the summer that it came out. So, I think we were trying to pull from those themes, and we came up with this art direction that was Paris in LA. It focused on a lot of the artistry of Paris in the neon summery context of LA, and we tried to use that as the anchor which we planned all the content and storytelling around. We played a lot with pop inspired art themes in the photography itself, using lots of repetition, shapes and geometry. We played on summery warm vibes, used a lot of color, played with shadow. 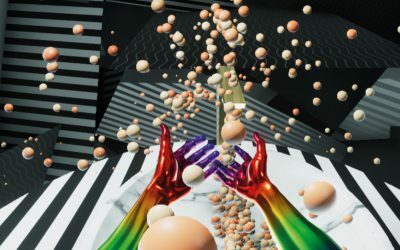 With film Ricky took a lot of inspiration from minimalist, quirky Japanese music videos, to see how they used the concepts of time and to play with looping things back and forth. He also experimented with the movement of shadows, and that same pop inspired repetition of movement, shape, and color. I feel like film and photography give us a way to showcase the album, as well as the food experience itself. We really wanted to focus on that relationship between food and music, and I think film and photography allowed us to add a different dimension to that. A hand grabs homemade tagliatelle with shrimp scampi and zucchini. Your website describes SIK/TENG as a “supper club concept”; do you have a communal meal as you create the series? I think as with all early concepts, at the initial stage we weren’t exactly sure what was going to be the best way for the concept to materialize and develop. The Wolfgang Amadeus series was our first trial of this, so we wanted to keep it in a more controlled environment. We kept it to just the seven of us, and it was a twelve-hour shoot. We got through quite a lot of content and different shots throughout that day, but we were kind of eating as we were going. 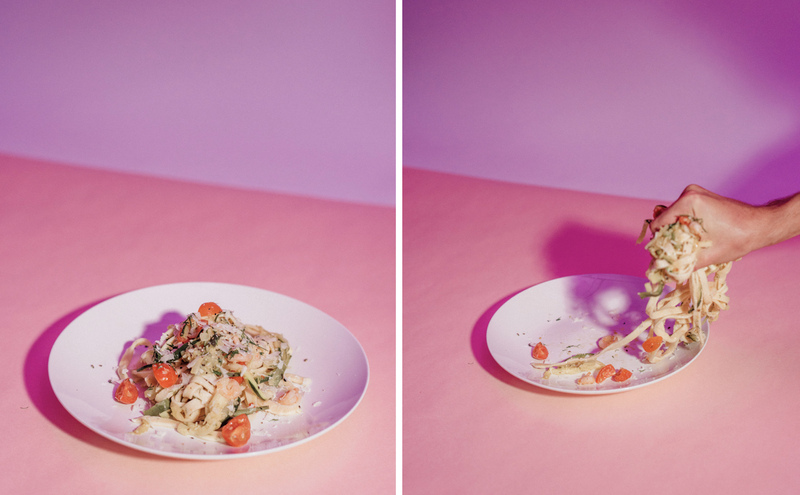 Then at the end the last thing we made and shot was the pasta dish, and it was quite a cool experience, after having worked on creating all these images and film shots throughout the day, to come sit down together and enjoy what we created. It was pretty special. For the second series that we shot we did invite a few close friends to be our guests for the evening, and I think the enjoyment of the food is an important part for all of us. The whole reason that we started this was very much to find an excuse to eat, play, and create together. In the future, there may be some instances where we invite people and open it to the public, and there may be some instances where we just keep it to a smaller group. It really depends on how we plan to tell the story of each film, and what’s unique to that. 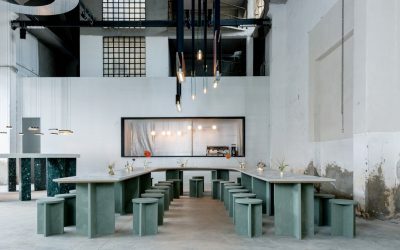 I would love for it to one day become something that we can open up to the public more widely, because I think the concept of supper clubs is a great way to experiment with different types of trends in gastronomy on a concept level, and it’s an alternative to the traditional dining experience. That’s something that we would love to contribute to from here in Hong Kong. Purple cauliflower is chopped as it is prepared to become a puree. MOLD: What do you hope SIK/TENG can accomplish in the future? The vision for SIK/TENG is for this to be a platform for creativity, bringing together creatives from food, art, and storytelling, all centered around music. For us SIK/TENG is a platform to showcase different types of creativity around Hong Kong. My goal is that we can cover a diverse range of musical albums, styles, and stories so that as we build upon what we’ve started, we’re building a very diverse and robust story of this relationship between food and music and creative storytelling.